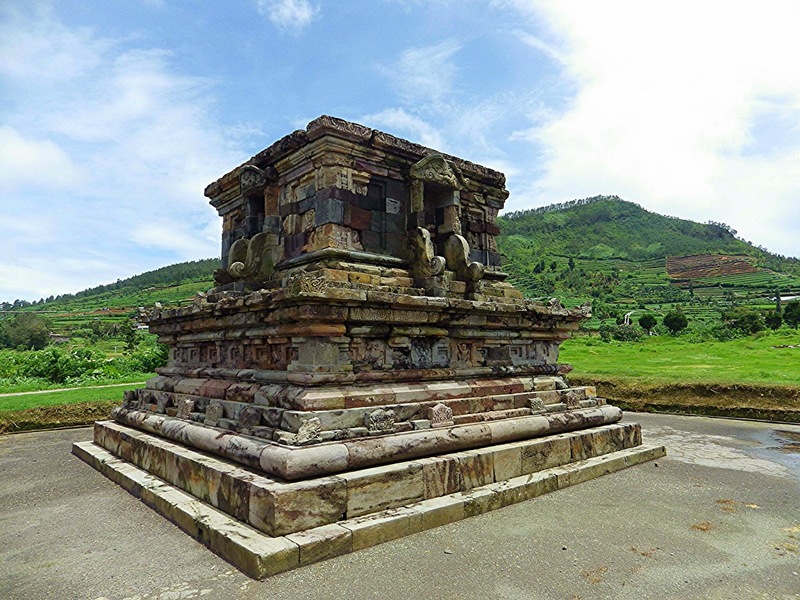 The Dieng Plateau is about 150 km from Yogajakarta in central Java. Being 2093 metres above sea level it is a unique part of Java, where everyone wears jackets and woolly hats, and chillies become an even more important part of the diet than at sea level. The plateau was formed by the collapse of the Mt Prau volcano, and is in fact a massive caldera. A lake formed after the collapse, most of it has now dried up, but the area is still very marshy. It is also extremely fertile, with tea, coffee, potatoes, carrots and onions all being grown in terraces around the plateau. As I traveled around the plateau I was told there was a local delicacy I should try made from a root vegetable, really unusual and I might not like the taste, but the locals loved it because of the cold although most Indonesian visitors disliked it, Kentang Goreng. I went to a stall and asked for it, prepared to be presented with something pretty exotic and inedible. I was surprised to be given fried chunky potato chips. Fresh and tasty, the local twist, which I really liked on the freezing cold day, was to munch on a chip and then take a bite of a green chilli. Creamy fried potato followed by a shock of spice. Nice, that was my lunch sorted. The Arjuna temples are quite small, but still impressive, particularly against the backdrop of green terraces and distant volcanoes. Built in the eight century they are the oldest Hindu temples in Java.They had become buried and flooded until rediscovered by the Dutch archaeologist Van Kinjbergen in 1853. You can walk inside each of the temples and see the intricate stone carvings, without the crowds of Borobadur. Nearby is the sulphuric lake of Telega Warna, a particularly smelly and cloudy green expanse of water, the remains of the larger lake formed after the caldera collapse. Worth a visit to see the constantly moving bubbling of gases in the water, and to marvel at the ducks who choose to live here, they are very wise as they are safe from becoming dinner due to their location, and likely sulphuric taste. A short walk from the lake is an active crater, Kawah Sikidang. Full of bubbling mud pools, volcanic vents, and clouds of sulphur. A really strange and desolate area surrounded by so much greenery, it is worth taking your time and exploring the crater. Take care as there are no marked paths as the bubbling pools and the vents are constantly moving. * You can get to the Dieng Plateau by public transport, but it is long journey made up of many bus changes and would be hard to return in a day. The tour bus from Yogjakarta is a reasonable 225,000 Rupiah, or hire your own car and driver for 500,000 Rupiah. Note the roads are terribly potholed, it is a very bumpy journey. * It is often cold and wet on the Plateau, take a coat and long trousers. Boots are a necessity if you want to explore the Arjuna temples. * Volcanic activity can close Kawah Sikidang.